In late 2009 and early 2010 unemployment rates in Europe and the United States were roughly equal, at about 10 percent of the labor force. Today the unemployment rate in the United States is 5.3 percent, while the unemployment rate in the euro zone is more than 11 percent. Not incidentally, a very large share of euro area unemployment consists of younger workers; the inability of these workers to gain skills and work experience will adversely affect Europe’s longer-term growth potential. The patterns illustrated in Figures 1 and 2 pose serious medium-term challenges for the euro area. The promise of the euro was both to increase prosperity and to foster closer European integration. But current economic conditions are hardly building public confidence in European economic policymakers or providing an environment conducive to fiscal stabilization and economic reform; and European solidarity will not flower under a system which produces such disparate outcomes among countries. The risks for the European project posed by these economic developments are real, no matter what the reasons for them may be. In fact, the reasons are not so difficult to identify. The slow recovery from the crisis of the euro zone as a whole is the result, among other factors, of (1) political resistance that delayed by many years the implementation of sufficiently aggressive monetary policies by the European Central Bank; (2) excessively tight fiscal policies, especially in countries like Germany that have some amount of “fiscal space” and thus no immediate need to tighten their belts; and (3) delays in taking the necessary steps, analogous to the banking “stress tests” in the United States in the spring of 2009, to restore confidence in the banking system. I would not, by the way, put “structural rigidities” very high on this list. Structural reforms are important for long-run growth, but cost-saving measures are less relevant when many workers are already idle; moreover, structural problems have existed in Europe for a long time and so can’t explain recent declines in performance. What about the strength of the German economy (and a few others) relative to the rest of the euro zone, as illustrated by Figure 2? As I discussed in an earlier post, Germany has benefited from having a currency, the euro, with an international value that is significantly weaker than a hypothetical German-only currency would be. Germany’s membership in the euro area has thus proved a major boost to German exports, relative to what they would be with an independent currency. Nobody is suggesting that the well-known efficiency and quality of German production are anything other than good things, or that German firms should not strive to compete in export markets. What is a problem, however, is that Germany has effectively chosen to rely on foreign rather than domestic demand to ensure full employment at home, as shown in its extraordinarily large and persistent trade surplus, currently almost 7.5 percent of the country’s GDP. Within a fixed-exchange-rate system like the euro currency area, such persistent imbalances are unhealthy, reducing demand and growth in trading partners and generating potentially destabilizing financial flows.3 Importantly, Germany’s large trade surplus puts all the burden of adjustment on countries with trade deficits, who must undergo painful deflation of wages and other costs to become more competitive. Germany could help restore balance within the euro zone and raise the currency area’s overall pace of growth by increasing spending at home, through measures like increasing investment in infrastructure, pushing for wage increases for German workers (to raise domestic consumption), and engaging in structural reforms to encourage more domestic demand. Such measures would entail little or no short-run sacrifice for Germans, and they would serve the country’s longer-term interests by reducing the risks of eventual euro breakup. 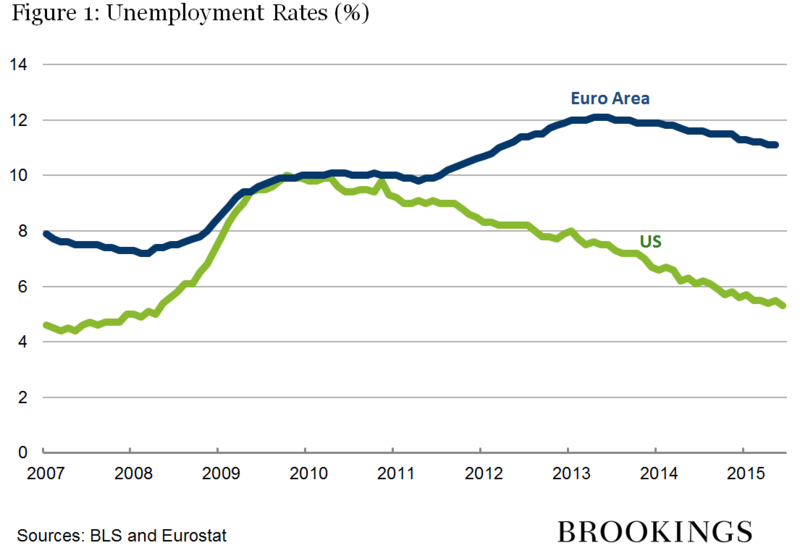 1 The euro and U.S. unemployment rates are not precisely comparable, but what matters for my purposes here is the overall pattern and direction of change. 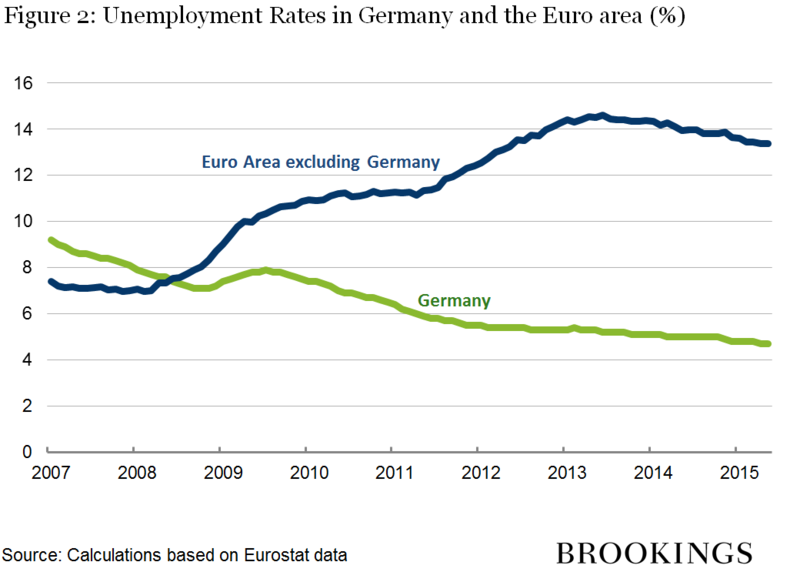 2 The unemployment rate for the euro zone ex Germany shown in Figure 2 has been “backed out” of the official data using official figures on unemployment rates and the number of unemployed for Germany and for the euro area as a whole. 3 Some have pointed out that much of Germany’s trade surplus is with countries outside the euro zone. That observation is largely irrelevant to my argument. The German surplus still likely displaces other euro zone exports to third countries, both directly and by leading to a euro that is stronger than it would be otherwise. Moreover, weak domestic demand in Germany means less demand for imports as well.